Locked / Unlocked: You can also see if access to your logs is currently locked or unlocked. If a password is set, clicking on the unlocked icon will lock access to your logs. To unlock access to your logs, select any of the quick access menu buttons on the widget and you will be taken to the password activity. 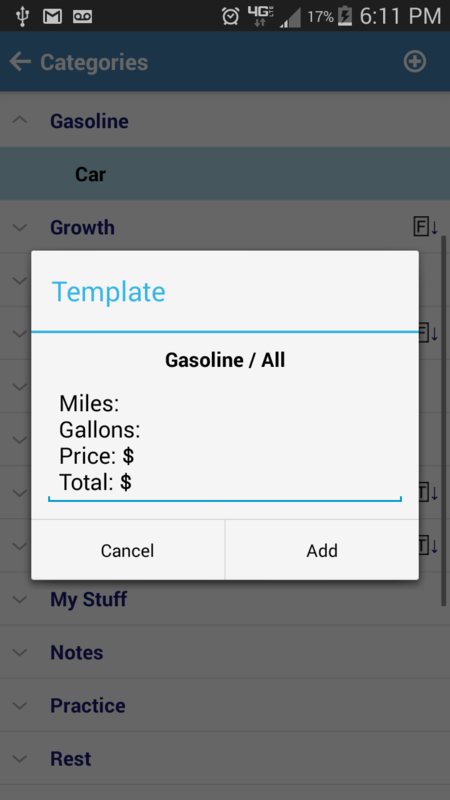 List View: Log entries are shown in a list. By default they are in descending order. You can change between descending and ascending from the filter settings view. 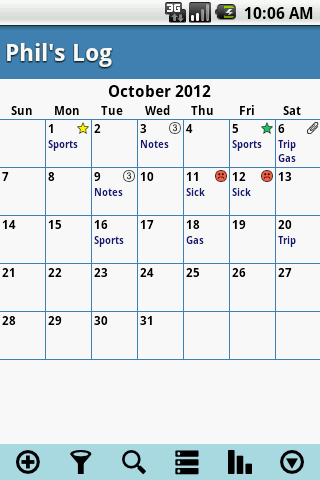 Calendar View: Log entries are shown in a calendar on the day they were entered. If there is no filter, then the Log Type is shown. 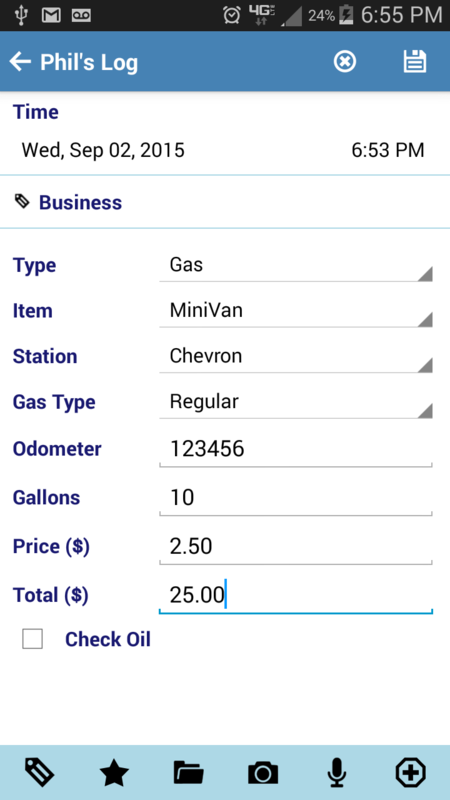 If the filter is set to a Log Type then the Log Item is shown. To change the month, swipe/flick your finger vertically up/down across the screen. Swipe down for the previous month, swipe up for the next month. 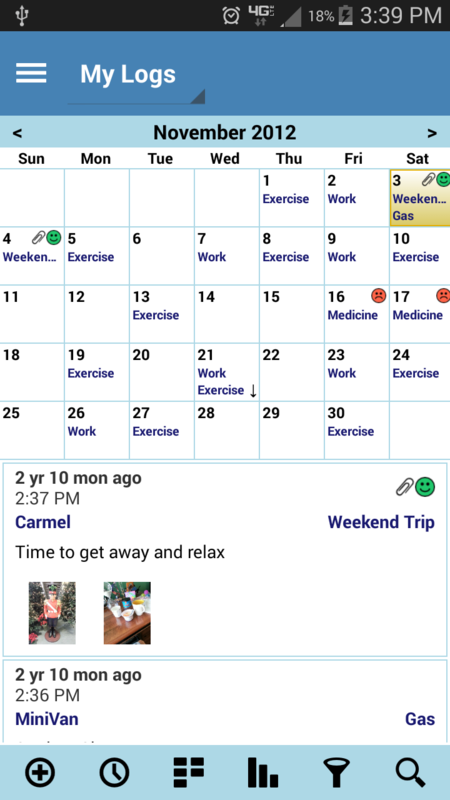 Note: To switch between the List and Calendar view, swipe/flick your finger horizontally across the screen. A small swipe is all that is needed. 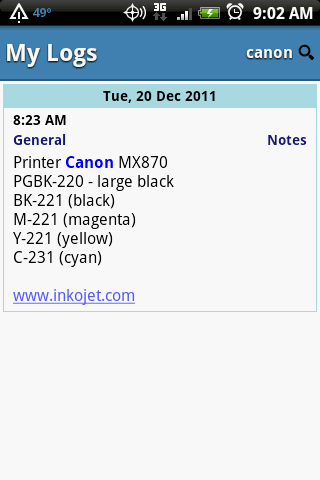 To view the log categories, select "Catergory List" from the options menu on the Log Entries view. 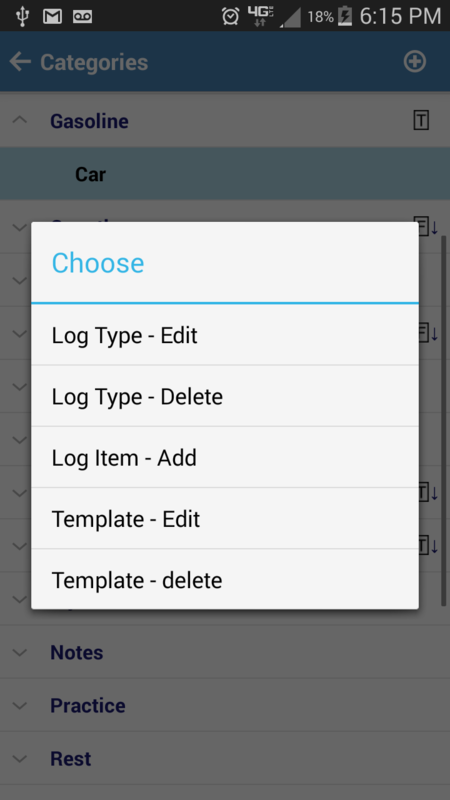 A list of available Log Types will be display. Each Log Type can be expanded to view all associated Log Items. Templates allow you to pre-define the log details for a log entry. It provides a starting point for log entries which are repeated. 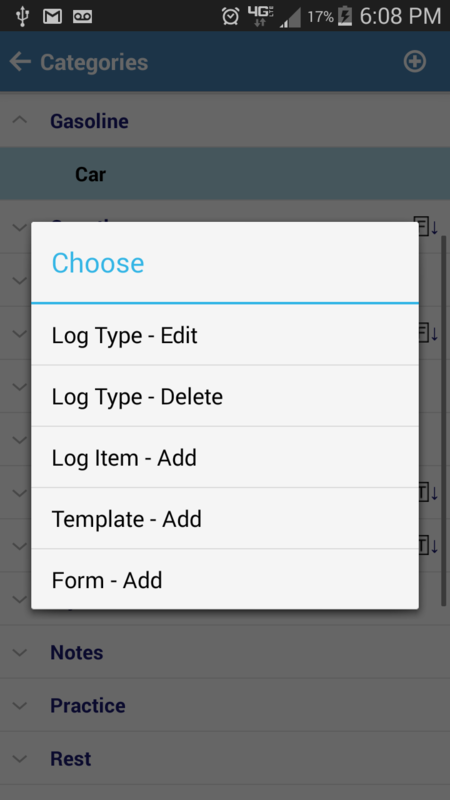 To add, edit, delete, or view the log templates, select "Catergories" from the options menu on the Log Entries view. 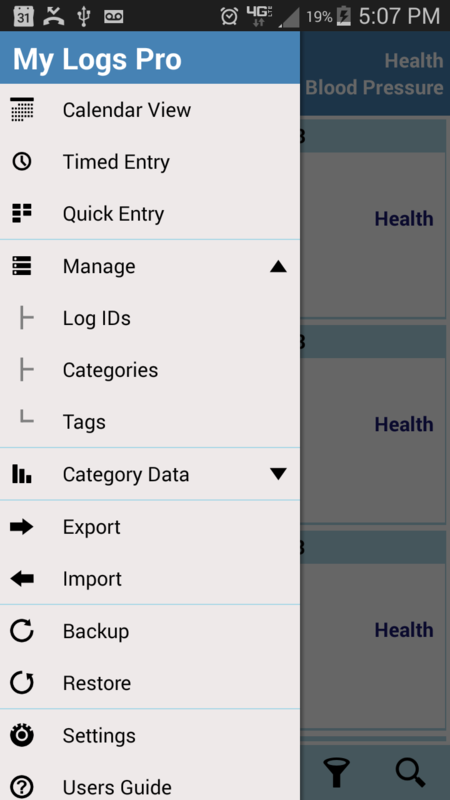 A list of available log categories will be display. To add a template, long press on the log type or log item which you would like to have a template and select "Add Template" from the context menu. Enter the template details and press save. Log types or items which have templates defined will have an icon with a "T" displayed to the right. To edit or delete a template, long press on the log type or item which already has a template defined and select either "Edit Template" or "Delete Template". 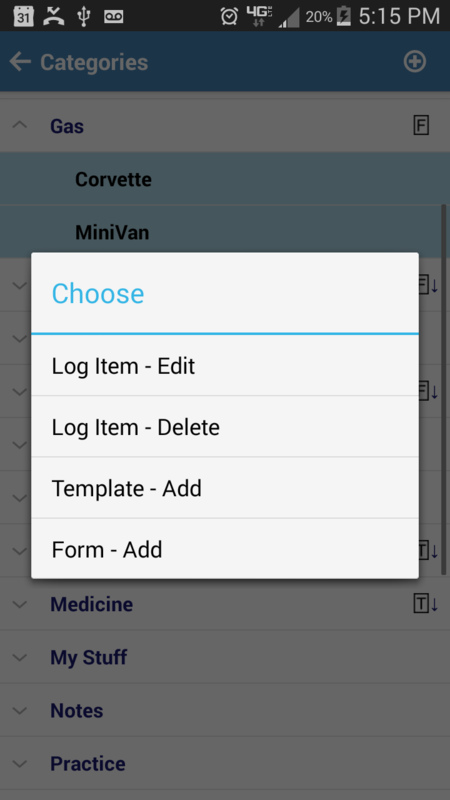 When finished entering log entry information, click the save icon to save the log entry to the database. Pressing the cancel icon will discard the log entry. Note: the back button also performs a save to the database. 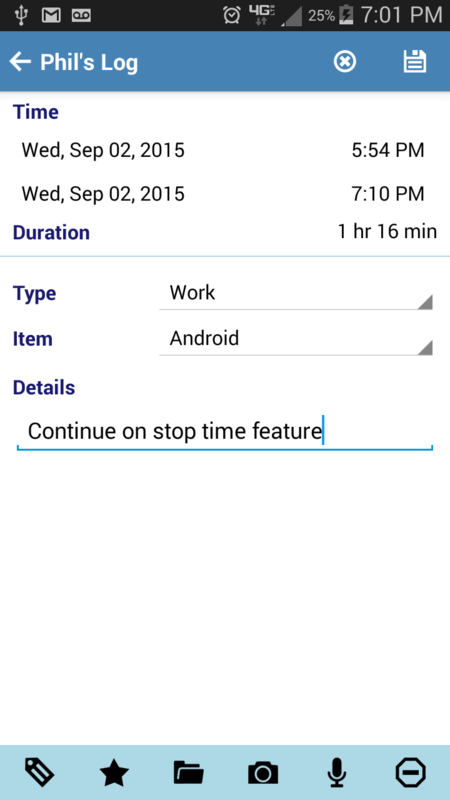 Stop Time: to add a stop time to a log select the stop menu icon located on the shortcut menu bar. 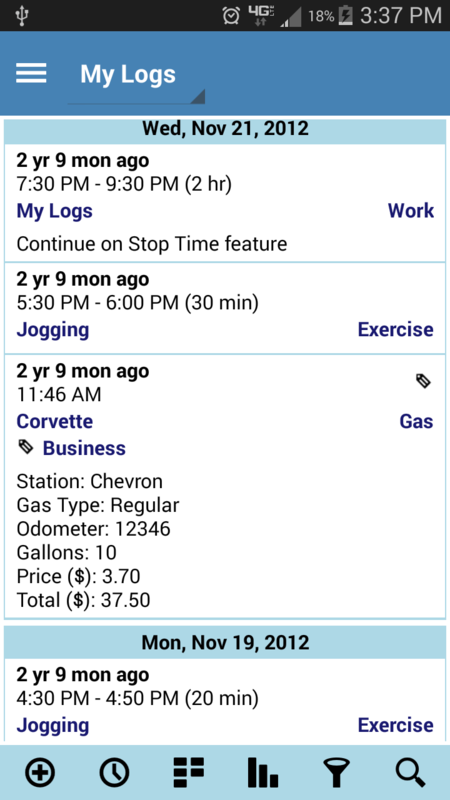 The log entry view will update to include log stop Date and Time buttons. 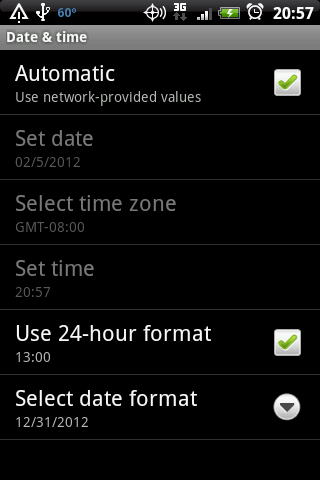 My Logs uses the phones system settings for the date & time format. You can change the time and date format by opening the phones system settings (Programs: Settings) and selecting Date & Time. Search allows you to search your log entries for a specified word. The search is case insensitive and searches all the log entry descriptions based on the filter settings. Make sure to set the filter settings to view all log entries if you want to search all your log entries. When Search is enabled, you will see the word you are searching for next to a search icon in the log header. 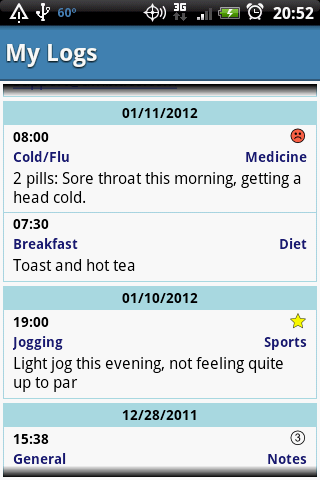 Log entries which contain the search word will be displayed in the view and the word will be highlighted. Backup: After selecting Backup, the database file is written to the SD card. You can copy the entire MyLogs folder (database and attachments) to a new location. NOTE: It is recommended that you make a copy to a different storage media such as your PC or laptop. Connect your old phone to your computer and copy the MyLogs folder to known location on your computer (e.g.Desktop). From your new phone, select Backup. 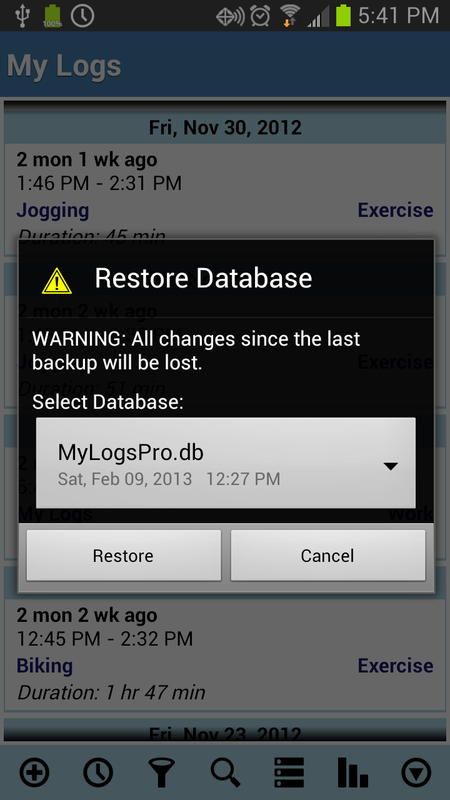 This will create the MyLogs folder on the SD card of the new phone. 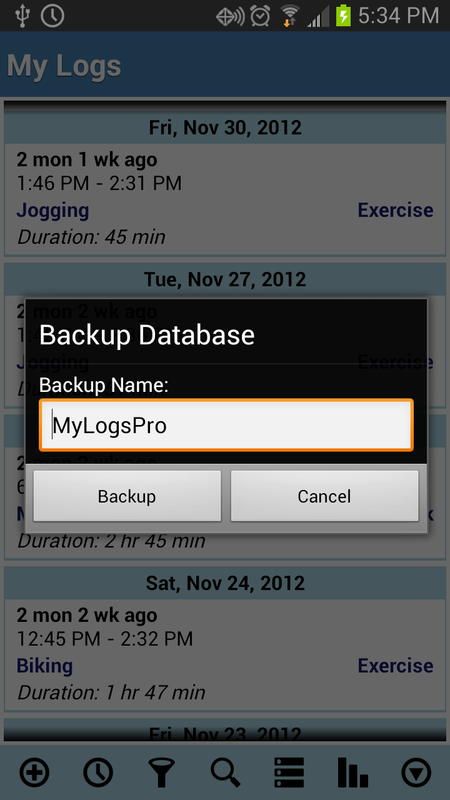 Connect the new phone to your computer and copy the MyLogs folder from your computer to the folder MyLogs of the new phone. Disconnect the new phone from your computer and select Restore.